"Beautiful skin requires commitment, not a miracle"
So that's what I'm trying to do! In the last year or so I've become very into my skincare, and I wish I had been like this all my life! I've noticed such a huge difference, from just making some small changes in my skincare routine. Here are the products I use almost daily, from morning to night time. 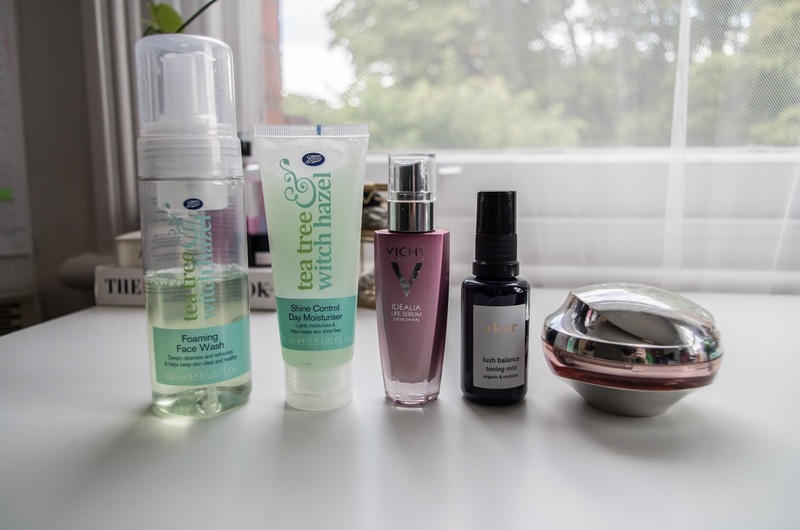 My morning routine - up until a few months ago, I didn't even use face wash in the morning! I would literally splash some water on my face, put on moisturizer (depending if I even remembered to!) and the layer on the makeup. BIG NO. I don't know what I was thinking - the amount of bad stuff that built up on my skin overnight was left there, under layers of makeup, for the entire day. No good. So now, I use a tea tree & witch hazel face wash every morning, to get rid of all the built up oil and ick from overnight. 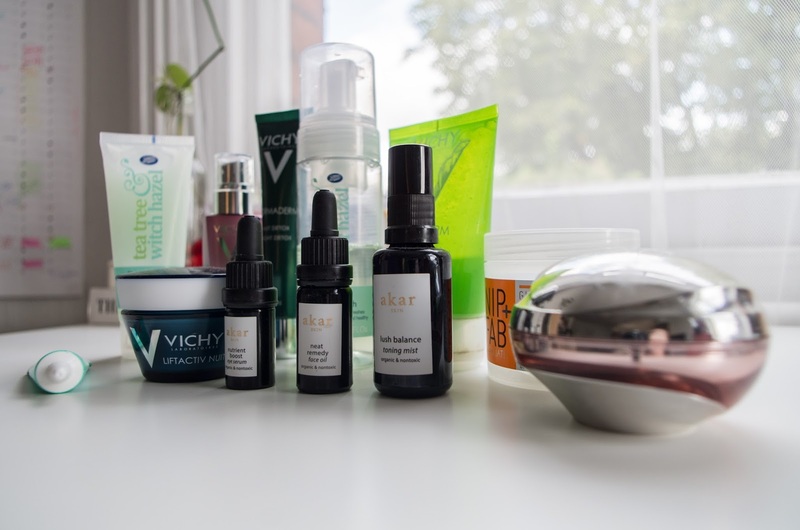 I then add a toner (another step I never used to do), then add a little bit of the Vichy Idealis serum - essentially an anti aging serum but it smells SO GOOD and leaves your skin so soft afterwards! Then, if my skin is feeling particularly dry or lifeless, I add this Shiseido Bio Performace cream, which is again, technically an anti aging cream, but I love it as it is so moisturising. My last step is this Shine Control moisturiser - my oily skin most definitely needs this on the daily! I know it sounds like a lot, but actually I fly through this every morning before my makeup! Then, my nighttime routine. A little more involved, I'll admit it, but hey - commitment. First up, I'll wash my face again with the same face wash, and every two or three days I use this Vichy Normaderm scrub to smooth out my skin. I've found these Glycolic pads from Nip & Fab absolutely amazing! I had lots of little comedones on my forehead and cheekbones, and after using these pads they have all but disappeared - I actually cut the pads in half to get some extra mileage out of them, and they've lasted absolutely ages. Then, I use a dry oil - I know. I never thought I'd see the day I'd be putting extra oil on my already incredibly oily skin, but there ya go! Bu this oil is MADE for oily skin - as it's dry oil, it balances sebum levels, calms breakout and inflamed areas and clears complexion. Just like magic! 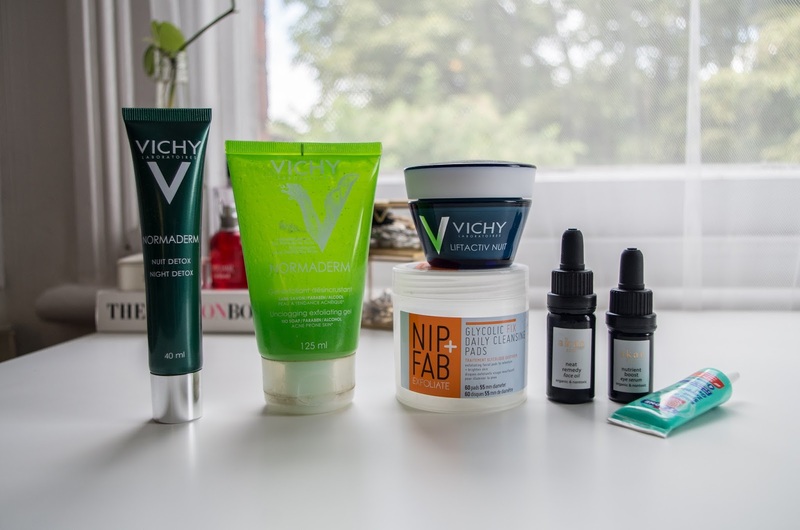 After this I use another Vichy anti aging night cream - again, I've been using this for years like almost every other Vichy product you see here, it's 100% one of my favourite skincare brands. Then, depending on the state of my skin, I'll use this little tea tree spot zapper for ones which have already come up and broken the skin, or this Vichy detox cream for the volcanoes lurking under skin level to pull them out and zap them later! And last but not least, I add a little eye serum to keep my peepers fresh. Et voila! It seems like a lot, I know, but I honestly love my routines! And I feel it has made such a huge difference to my skin the last few months - much less breakouts than before and just overall feeling better in my skin! 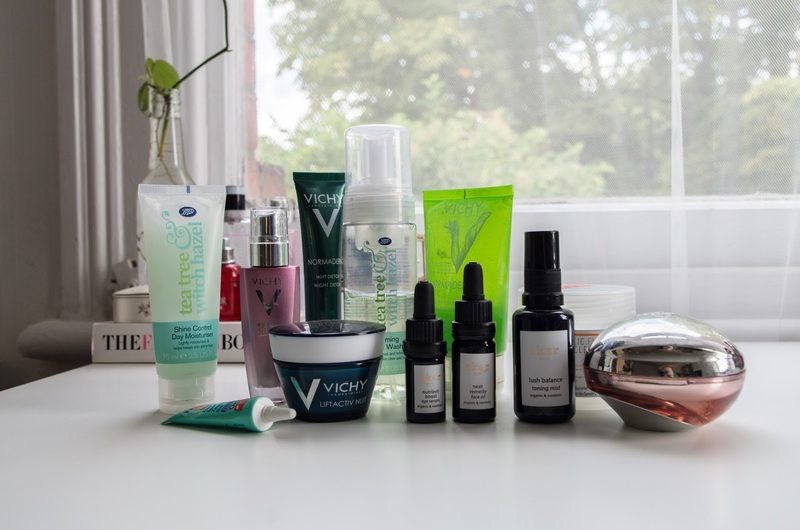 Check this link for some tried, tested and rated facial goodies!